"Autumn Crossroads in Vero Beach, FL"
Judy and Jack were looking for an art piece for their new home in Port St. Lucie. The entry way into their merged paradise had a blank wall that called for just the right art piece - but what that would be, Judy did not know. They saw this wall mural and thought it would work. I delivered it and upon installing the piece, it was as if I had made it just for them, but I hadn't met them until that afternoon! Jack said 'it is perfect!' and Judy walked down the hall and proclaimed 'I love it!". Judy felt the other 'floral' work at the Vero Beach Art Festival had too much 'Florida' in it. She wanted a piece that merged her northern furniture palette with her new southern digs. 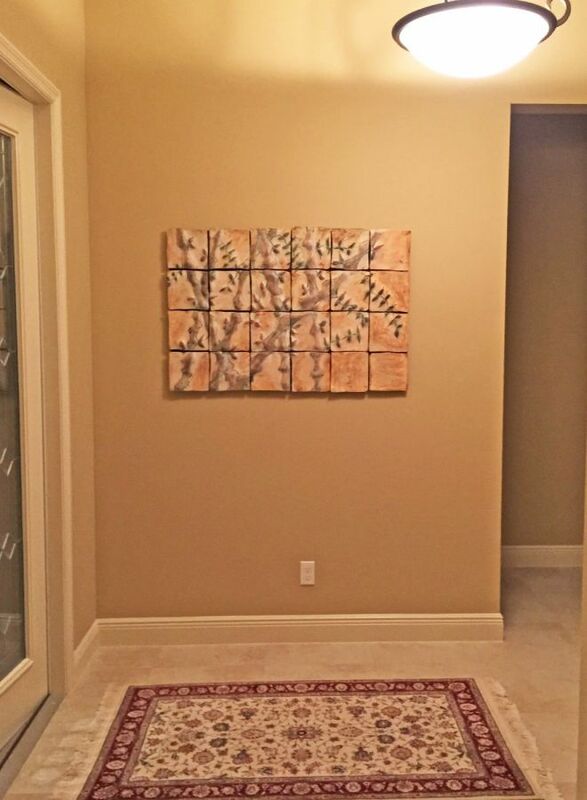 Soft earthy colors with a splash of red in the leaves of this bamboo wall art mural was the perfect bridge. Thank you Judy & Jack, for making Autumn Crossroads the first art piece guests will see as they enter your beautiful home.